Draft: 2008, Pittsburgh Pirates, 3rd rd. Resides in Edmond, OK, in the offseason, with his wife, Kasey, and their sons, Maverick, Maddon and Manning...Participated in the Tigers Winter Caravan...Played college baseball at Oklahoma State University, where he was a three-time All-Big 12 selection... was a two-way player for the Cowboys and ended his collegiate career as the school's all-time saves leader with 17...was elected into the Oklahoma State Cowboy Baseball Hall of Fame in November, 2016...Won silver medals as a member of Team USA at the Pan American Games in Brazil in 2007 and in Mexico in 2011. Established a career high with 29 doubles in 2018 as he completed his seventh season with the Pirates...Led all National League players with 86 hits from the eighth spot of the batting order and ranked second behind Dansby Swanson with 33 RBI...Hit safely in each of his first 14 home games through May 11, the longest streak to start a season at home for a Pirates player since Dave Parker had at least one hit in the first 17 home games of 1976...Tied a career high with four RBI and went 3x4 on July 12 vs. Milwaukee... Sidelined from August 15-29 with a left calf strain. Set a career high in home runs and fell one RBI shy of his career-high 59 (2016)...His 14 home runs were the fourth-highest single-season total by a Pirates shortstop and the most since Jay Bell hit 16 in 1991...Also set career highs in triples and total bases (204) and tied career high in walks...Ranked fourth among N.L. shortstops in fielding percentage (.982), third in games (144) and second in starts (137) behind Philadelphia's Freddy Galvis (155)...His .284 average while batting eighth in the lineup was the third-highest in the league at that position, trailing Javier Baez (.299) and Miguel Rojas (.292)...Was the Opening Day starter at shortstop for the fourth straight season...Connected off CC Sabathia for a leadoff home run on 4/21 at PNC Park (his second career homer leading off the first inning)...Had his 100th career double on 5/3 at Cincinnati...Homered in back-to-back games on 5/23-24 and joined Jose Osuna and David Freese with back-to-back-to-back homers in the 10th inning on 5/24 at Atlanta...Tied career high with an 11-game hitting streak between 6/9-21 (15-for-39, .385)...Hit .364 (44-for-121) over a 32-game span from 5/16 thru 6/21, raising average from .203 to a seasonhigh .283...His fielding error on 6/25 at St. Louis was his first since 4/26; went 51 consecutive games and 201 chances between errors...Tied his career high (third time) with four RBI on 9/23 vs. St. Louis...Missed the last seven games due to a sore left knee. Made a career-high 146 appearances and 142 starts at shortstop...His .985 fielding percentage ranked third among N.L. shortstops behind Philadelphia's Freddy Galvis (.987) and New York's Asdrubal Cabrera (.986)...Also ranked third in total chances (607) and his 95 double plays turned ranked second behind Washington's Danny Espinosa (96)...Set career highs in RBI, hits, walks and runs scored...Made 23 starts from the leadoff spot of the batting order (Pirates went 14-9)... Was the Opening Day starter at shortstop for the third straight year... Connected off Patrick Corbin for a 466' home run on 4/22 at Arizona... Hit .318 (27-for-85) in April and was batting .307 following a nine-game hitting streak (13-for-30, .433) from 5/15-24...His triple on 5/20 vs. Colorado was his first since 8/13/14...Tied career-high with his 11-game hitting streak between 6/16-23 (13-for-34, .382)...Had a career-high 52- game errorless streak between 5/17 and 7/17...Batted leadoff against a RHP (Zach Eflin) for the first time in his career on 7/22 vs. Philadelphia and went hitless in four at bats...Hit .325 (27-for-83) in July (24 games) and .179 (17-for-95) in August (26 games)...Hit first career grand slam and tied career high with four RBI on 8/26 at Milwaukee...Missed the last three games and four of the last five with a right forearm strain. Was Pittsburgh's most-used shortstop, making 115 appearances (108 starts) at that position...Made his second straight Opening Day start at shortstop...Left the game on 4/19 in the sixth inning after being hit in the ribs by Matt Garza and missed the next three games...Picked up his first extra-base hit (double) in his 19th game on 5/1 at St. Louis...Produced three RBI and a two-run, game-winning double in a 7-5 victory vs. St. Louis on 5/9...Homered in back-to-back games on 6/2-3 at San Francisco...Had four straight multi-hit games from 6/25-28 and hit .304 (28-for-92) in 25 games during the month of June...Hit .444 (16-for-36) during a season-high eightgame hitting streak from 6/24 to 7/2...Suffered a lower leg contusion and a sprain of the medial collateral ligament of his left knee on 7/19 at Milwaukee (Carlos Gomez slid into him) and was placed on the 15-day disabled list the following day...Began a rehab assignment with Triple-A Indianapolis on 8/11...Homered and had three RBI on 8/21 at Charlotte...Was recalled from rehab assignment and reinstated from D.L. on 8/23...Tied career high (third time) with four hits on 9/21 at Colorado...Hit a three-run homer on 9/26 at Chicago - his first homer since 6/3...Hit .248 (30-for-121) in 36 games after returning to big league action on 8/23...Batted .272 over the course of his final 77 games with the Pirates, dating back to 5/30...Hit all three of his home runs on the road. 2015 POSTSEASON: Was the starting shortstop and went hitless in two at bats in the Wild Card Game vs. Chicago on 10/7 (played seven innings). Established career highs in every category during his first full season as a starting shortstop...Led Pirates in games played...His .437 slugging pct. from 5/31 thru the end of the regular season ranked second behind Jhonny Peralta (.447) among National League shortstops and his 49 RBI ranked third behind Ian Desmond (59) and Peralta (52)...Recorded a .314 batting average against LHP and holds a .340 career average against left-handed pitchers...His home run total was the highest by a Pittsburgh shortstop since Pat Meares hit 13 in 2000...Made 144 appearances (137 starts) at shortstop and one appearance in right field...Made his first career Opening Day start at shortstop...Was spiked in the right leg on 4/18 by Milwaukee's Martin Maldonado and had to leave the game an inning later...Returned to action the following night and flied out as a pinch hitter...Singled as a pinch hitter on 4/20 vs. Milwaukee...Made his first career appearance in the outfield on 5/10 vs. St. Louis; played final two innings in right field (no chances)...Connected off Shelby Miller for first home run on 5/11 at PNC Park...Raised batting average 65 points from .156 on 5/4 to .221 on 5/20 after going 15- for-45 (.333) in 12 games...Hit second home run, tied career high (second time) with four hits and scored a career-high four runs on 6/2 at San Diego...Homered and had three RBI on 6/6 vs. Milwaukee...Went deep in back-toback games on 6/21 and 6/22...Led N.L. shortstops in homers (five) during the month of June and shared Major League lead with Seattle's Brad Miller...Had career-high four RBI on 7/4 vs. Philadelphia...Delivered walkoff double in 11th inning on 7/19 vs. Colorado...Hit .319 (29-for-91) in 26 games during the month of July...Batted third in the lineup for the first time in his career on 8/12 vs. Detroit; the first starting shortstop to do so for the Pirates since Freddy Sanchez on 9/6/06...Left game in seventh inning on 8/14 at Detroit with right forearm tightness...Made 49 straight starts at shortstop before not doing so on 8/15; longest streak since Jack Wilson in 2005 (96 starts)...Returned to starting lineup on 8/19...Homered in back-to-back games on 9/6-7 at Chicago (NL) and produced three straight multi-hit games from 9/6-8...Reached base safely in 20 of his last 25 games, beginning on 8/31...Produced a .379 (22-for-58) batting average and 10 RBI in 15 games from the second spot of the lineup...Went hitless in four at bats in the Wild Card Game vs. San Francisco on 10/1. 2013 SEASON: Began season with Triple-A Indianapolis and hit .333 with 19 RBI and a .404 OBP in 26 games thru 5/2...Was recalled by Pittsburgh on 5/3 when Neil Walker went on the disabled list...Made start at second base and hit second in the lineup on 5/3 vs. Washington; hit a game-winning home run off Ross Detwiler in the fifth inning (broke a 1-1 tie)...Made five straight starts at second base from 5/3-8 and hit safely in four of the games...Had first career two-homer game on 5/11 at New York (NL)...Was optioned back to Triple-A when Walker came off the D.L. on 5/13, but did not appear in any games with Indy...Was recalled on 5/15 when John McDonald was placed on the D.L. and remained with the Pirates for the rest of the season....Had three hits on 5/26 at Milwaukee...Made first and only career appearance at first base on 6/1 vs. Cincinnati (played final inning and had one putout)...Made 13 straight starts at short between 6/15 and 7/3...Went 3-for-4 with a homer on 6/21 at Los Angeles (AL)...Snapped a 1-for-11 streak with a two-hit game on 6/26 at Seattle which included the game-winning hit in the ninth inning...Hit safely in a career-high 11 straight games from 7/10-26 (15-for-44, .341)...Appeared in 24 of Pittsburgh's 28 games during the month of August, making 18 starts at shortstop and one each at third base and second base...Made lone start at third base on 8/23 at San Francisco...Hit .347 (17-for-49) in 16 games in September...Had a career-high four hits on 9/10 at Texas...Hit .405 (15-for-37) with five doubles, a triple and two homers in his last 11 regular season games...Had an inside-the-park homer on 9/29 at Cincinnati...Made 78 appearances (63 starts) at shortstop, 26 appearances (20 starts) at second base, one start at third base and one appearance at first base while playing with the Pirates...Committed 12 of his 15 errors while playing shortstop...Produced a .410 (32-for-78) average against LHP...Also hit .325 (41-for-126) with runners on base and .308 (20-for-65) with runners in scoring position...Went 43-for-122 (.352) with 15 doubles, four home runs, 12 RBI and 17 runs scored in 30 games from the second spot of the batting order...Went 1-for-2 with an RBI as a pinch hitter. 2013 POSTSEASON: Went 2-for-8 (.250) with a walk in five games during the N.L.D.S. against St. Louis...Made lone start at shortstop in Game Two at Busch Stadium on 10/4 and went 1-for-3 with a walk. Split season between Triple-A Indianapolis and Pittsburgh...Began season with Indianapolis and went 4-for-6 in his second game on 4/7 at Toledo...Went 7-for-50 (.140) in his next 14 games, dropping his average to .200 on 4/22...Homered in back-toback games on 4/11-12...Hit .358 (34-for-95) in 24 games during the month of May and .357 (41-for-115) in 31 games from 4/23 to 5/28, raising average from .200 to .303...Had a season-high 14-game hitting streak from 4/30 to 5/13 (21-for-56, .375)...Was recalled by Pittsburgh on 5/29...Grounded out as a pinch hitter while making Major League debut on 5/29 vs. Cincinnati...Made first start with Pirates at shortstop on 5/30 vs. Cincinnati and singled off Johnny Cueto in first at bat (second Major League AB)...Went 1-for-9 in five games before being optioned back to Indianapolis on 6/24...Went 7-for-34 (.206) in nine Triple-A games before being recalled by Pittsburgh on 7/5 when Alex Presley went on the 7-day disabled list; remained in the big leagues for the rest of the season...Made 33 appearances at shortstop, 12 at second base and 10 at third base while playing with Indianapolis; hit .441 (15-for-34) in his 10 games as a third baseman...Hit safely in four straight games with the Pirates from 7/15-22, going 4-for-8 with three doubles and a triple...Connected off Arizona's Josh Collmenter for first Major League home run on 8/8 at PNC Park...Made four straight starts between 8/15-18 and went 3-for-14...Went 4-for-8 with two doubles and two RBI in back-to-back games at St. Louis on 8/18-19...Was on three-day Paternity List from 8/21-24 for the birth of his son Maverick on 8/20...Went 2-for-10 in his final 17 games, appearing mostly as a pinch runner or late inning replacement...Made backto-back starts on 9/27-28 and had two hits in six at bats...Made a total of 28 appearances (nine starts) at shortstop, seven appearances (four starts) at second base and one appearance (9/12 at Cincinnati) at third base with the Pirates...Committed lone error while playing shortstop on 8/8...Went 9-for-43 (.209) with three doubles, a homer and five RBI in his 13 big league starts...Produced a .292 average in 17 games on the road and a .158 mark in 25 games at PNC Park. Split season between Double-A Altoona and Triple-A Indianapolis...Hit .255 (125-for-491) with 30 doubles, 19 homeruns and 69 RBI in 132 total games...Led Pittsburgh farm system in home runs...Set career highs in games, runs and home runs...Beganseason with Altoona, where he made all 72 defensive appearances at shortstop...Homered in three of his four games from 4/14-20...Hit.154 (12-for-78) in his first 20 games thru 4/30, but rebounded to bat .318 (34-for-107) in May...Homered twice and tallied five RBI on5/11 at Harrisburg...Hit .313 (25-for-80) in June, which included his second two-homer game on 6/5 vs. Portland...Produced season-high13-game hitting streak from 5/25 thru 6/8, going 16-for-50 (.320) with four homers and 10 RBI...Was named Eastern League Player-ofthe-Week for week of 6/13-20 after going 8-for-21 (.381) with two home runs and nine RBI in six games...Was leading Altoona in home runsand RBI when he was promoted to Indianapolis on 6/28...Homered in back-to-back games with Indy on 7/9-10...Batted .180 (18-for-100)in his first 27 Triple-A games thru 7/31...Hit .313 (35-for-112) and knocked in 15 runs in 29 games during the month of August...Homeredin three straight games from 8/29-31...Made final appearance of the season in left field on 9/5 at Louisville...Also made 34 appearancesat second base and 25 at shortstop while playing with Indianapolis. Spent entire season with Altoona, the Eastern League champions...Established career highs in hits and batting average...Made54 appearances at third base, 49 at second base and 20 at shortstop...Hit safely in his first seven games...Hit his first Double-A homerun on 4/22 vs. Erie and fell a single shy of hitting for the cycle in that game...Batted .312 (29-for-93) in 25 games during the month ofJune...Ended regular season with a six-game hitting streak, which included a four-hit game on 9/2 at Bowie; his third four-hit game of theseason...Went 7-for-37 (.189) in eight playoff games...Hit three home runs in the post season and knocked in six runs...Had first careertwo-homer game in Game Two of the Championship Series against Trenton on 9/15...Participated in the Arizona Fall League and hit .267(20-for-75) with four doubles, a homer and 13 RBI in 20 games with Mesa. Spent entire season with Carolina League Champion Lynchburg club...Made 107 appearances at shortstop and 21 at third base...Led league in doubles and sacrifice flies...Ranked second in at bats, fifth in hits and fifth in RBI...Set minor league career highs in at bats,doubles and RBI...Also led Carolina League shortstops in double plays turned (86)...Ranked second among Pittsburgh farmhands in RBI...Knocked in 22 runs in his final 24 regular season games...Hit .314 with a homer and four RBI in the post season...Had four hits in the finalgame of the Mills Cup Championship. Made professional debut with State College on 6/20/08 and hit first pro home run in his fifth game on 6/24 vs. Williamsport...Hitsafely in four of his six games with the Spikes before being promoted to Class-A Hickory on 6/26...Ended season with a 10-game hittingstreak...Hit .306 (26-for-85) in final 22 games to raise season average from .206 on 7/29 to its season-ending mark of .250...Made all 53defensive appearances at shortstop between the two clubs. April 14, 2019 Detroit Tigers placed SS Jordy Mercer on the 10-day injured list. Right quad strain. 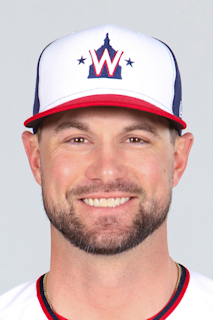 December 14, 2018 Detroit Tigers signed free agent SS Jordy Mercer. October 29, 2018 SS Jordy Mercer elected free agency. August 29, 2018 Pittsburgh Pirates activated SS Jordy Mercer from the 10-day disabled list. August 16, 2018 Pittsburgh Pirates placed SS Jordy Mercer on the 10-day disabled list retroactive to August 15, 2018. Left calf strain. August 23, 2015 Pittsburgh Pirates activated SS Jordy Mercer from the 15-day disabled list. August 11, 2015 Pittsburgh Pirates sent SS Jordy Mercer on a rehab assignment to Indianapolis Indians. May 15, 2013 Pittsburgh Pirates recalled SS Jordy Mercer from Indianapolis Indians. May 13, 2013 Pittsburgh Pirates optioned Jordy Mercer to Indianapolis Indians. May 3, 2013 Pittsburgh Pirates recalled Jordy Mercer from Indianapolis Indians. March 27, 2013 Pittsburgh Pirates optioned Jordy Mercer to Indianapolis Indians. August 24, 2012 Pittsburgh Pirates activated SS Jordy Mercer from the paternity list. July 5, 2012 Pittsburgh Pirates recalled Jordy Mercer from Indianapolis Indians. June 24, 2012 Pittsburgh Pirates optioned Jordy Mercer to Indianapolis Indians. May 29, 2012 Pittsburgh Pirates recalled Jordy Mercer from Indianapolis Indians. March 24, 2012 Pittsburgh Pirates optioned Jordy Mercer to Indianapolis Indians. November 18, 2011 Pittsburgh Pirates selected the contract of Jordy Mercer from Indianapolis Indians. June 28, 2011 Jordy Mercer assigned to Indianapolis Indians from Altoona Curve. March 12, 2011 SS Jordy Mercer assigned to Pittsburgh Pirates. August 31, 2010 Jordy Mercer assigned to Mesa Solar Sox. March 8, 2010 SS Jordy Mercer assigned to Pittsburgh Pirates.